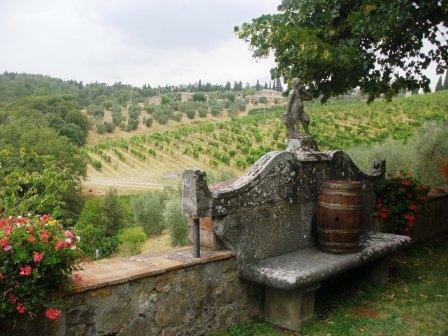 Dievole is a corner of Tuscany that has been always known to be a small paradise. Here, the dialogue between nature and man was never interrupted and the name can explain the reason: the origin of the name "Dievole" is "Dio vuole" (God wants). The name first appeared in the 11th century, specifically on May 10, 1090. On this date, two capons, three loaves of bread, and six "denari lucchesi" of good silver were paid for the yearly contract of a vineyard in a divine valley known as "Dievole." And the estate is truly divine. Dievole's vineyards, planted in sandy, clay, and limestone soils at altitudes of 300-370 meters above seal level sit amongst nearly 30km of nature paths, which are open to the public. The estate, a working agriturismo, has been recently renovated, and is an incredible place to spend a few days enjoying the local delights of the Chianti Classico region. In 2012, Dievole began a gradual renovation with the goal of making high-quality, terroir-driven wines. Farming is strictly organic (the estate will be certified organic with the 2016 vintage) with biodynamic practices, all work is done by hand, and only ambient yeasts are used for long fermentations in large cement tanks. The team of Alberto Antonini (consulting oenologist), Giovanni Alberio (on-premise oenologist) and Lorenzo Bernini (agronomist) has effected incredible change in a very short period of time. We are thrilled about the future of this exciting project!